Natimuk, a rural township, is on the Wimmera Highway, 25 km west of Horsham. Mount Arapiles, a striking feature in the Wimmera landscape, is 10 km west of Natimuk. The Natimuk area came under closer settlement with the arrival of farmers from South Australia in about 1870-71. Many of them were of the German Lutheran tradition, and a Lutheran church was opened in 1874. 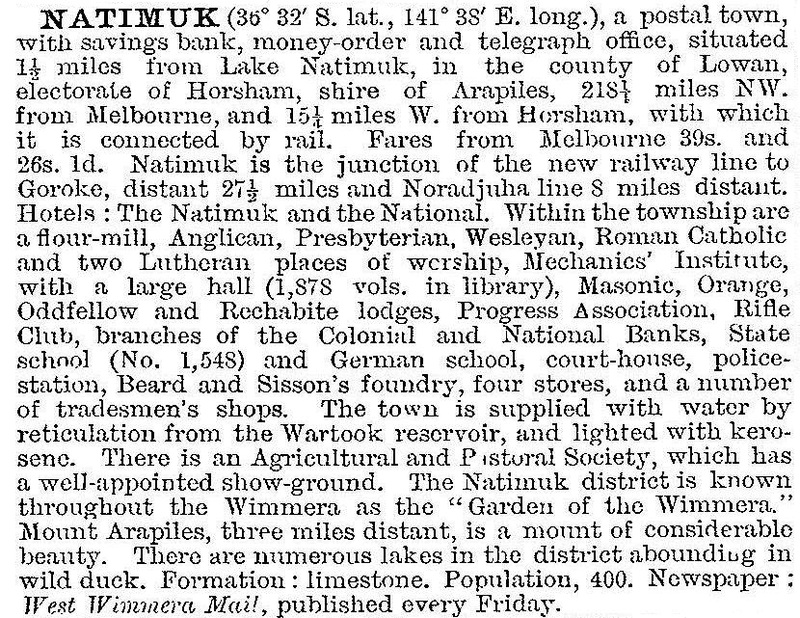 Natimuk township was surveyed in 1875, and named after a creek of the same name which empties into Lake Natimuk, 4 km north of the town. It is thought that the name was derived from an Aboriginal word meaning little creek. The Natimuk school was opened in 1875, teaching children as well as older Germans who needed coaching in English. Between 1875 and 1878 two of the German settlers established a flour mill. In 1887 Natimuk district gained its own local government unit when Arapiles Shire was formed in 1888 by severance from Wimmera Shire. The shire’s administrative centre was put at the small town of Noradjuha, about 10 km south of Natimuk. The population was rising quite quickly at that time, and Natimuk had five churches, two hotels, three stores, an agricultural society, a mechanics' institute and a large foundry. There was also the West Wimmera Mail and Natimuk Advertiser (1887). In 1889 Alfred Lockwood bought the newspaper, running it as a country editor for 50 years. His sons Douglas and Rupert became well-known authors and another son, Frank, succeeded to the paper’s managership. Alan Lockwood, the last of his six sons, wrote his biography and was the paper’s editor. After about 1910 Natimuk’s population underwent a gradual decline, as did the shire’s. Horsham’s population grew, probably at their expense. Natimuk was the commercial centre of a small shire which for 50 years debated moving the shire offices from Noradjuha. Finally, in 1952 (when building materials were scarce), the shire offices were transferred by low-loader to Natimuk. Mount Arapiles has been a popular picnic spot since before the turn of the century, and since the 1950s has been popular with rock climbers. There are many climbs with a wide range of degrees of difficulty, attracting Australian and international visitors. The climbers have provided additional income, and some have stabilised the town’s population. In 1997 Natimuk’s Brigitte Muir was the first Australian woman to scale Mount Everest and the tallest mountains on seven continents. Natimuk has a school (41 pupils, 2014) which has been the only one in the town since the Lutheran school was closed during World War I. The Lutheran church (rebuilt in 1963) remains a testament to the continuing religious tradition; there are also Anglican, Catholic and Uniting churches. Swimming is provided at Lake Natimuk – one of the few fresh water lakes in the area – and there are golf, bowling and tennis facilities. A recreation reserve is next to the school. There is a medical centre, a hotel, a caravan park, a showground and a museum in the former court house. The railway lines which ran from Horsham to Goroke via Natimuk and to Balmoral and Hamilton via Natimuk have been closed. Natimuk's long-running problems with water quality were ameliorated with the completion of the Wimmera-Mallee pipeline that brought treated drinking water to Natimuk in 2010. In September 2010 and again in January 2011 many parts of regional Victoria experienced widespread severe flooding. In Natimuk the town’s two creeks rose rapidly and floodwater inundated the main street and flowed into several businesses.